A major earthquake occurred on Wednesday, May 3, 2006 in the Tonga segment of the Tonga-Kermadec Subduction Zone, near the islands of the Kingdom of Tonga. A small tsunami was generated. A regional tsunami warning was issued by the Pacific Tsunami Warning Center in Honolulu. Damage from the earthquake was minor. The following preliminary report documents the earthquake, past events in the region and the tectonics of subduction along the Tonga segment of the Trench. Additionally, the report provides an evaluation why only a minor tsunami was generated. Origin Time, Magnitude, Epicenter and Focal Depth: The earthquake occurred on Wednesday, May 3, 2006 at 3:26 p.m. UTC, (Thursday, 4:26 a.m. local time in Tonga). According to the USGS (NEIS), the epicenter was at 20.130°S, 174.164°W - about 160 km (100 miles) NE of Nuku'alofa (capital of Tonga), 165 km (100 miles) S of Neiafu, Tonga 465 km (290 miles) S of Hihifo, Tonga and 2145 km (1330 miles) NNE of Auckland, New Zealand. The quake had a magnitude of 7.9 and s focal depth of 55 km (34.2 miles). It was reported to be the strongest felt earthquake in recent years. According to a report from Neiafu, 180 miles north of Nuku'alofa, the quake's strong motions lasted for about 90 seconds. A series of aftershocks with magnitudes of up to 6.0 and 5.4 occurred on May 5 in the same area as the major earthquake. According to the U.S. Geological Survey at least six aftershocks occurred near Tonga, while others were recorded near Fiji and Vanuatu. The strongest aftershock near Tonga occurred at 12:25 a.m. local time, on May 5. It had a focal depth of about 24 miles. There were no fatalities reported. The damage was minor in all of the islands. A power failure for about two hours prevented the receipt of the tsunami warning from the Pacific Tsunami Warning Center. The following is a cursory review of the tectonic setting of the Tonga Kermadec-Tonga Subduction Zone and Arc. Active westward movement of the Pacific oceanic lithosphere underneath the Australian plate has formed an extensive tectonic boundary in the Southwest Pacific Ocean. The boundary consists of the Tonga-Kermadec Subduction Zone - marked by a great trench - and its associated adjacent volcanic arc. The Kermadec-Tonga Arc is an intraoceanic arc, one of the longest on earth. It is bounded on both sides by oceanic crust. The arc includes at least 100 volcanoes, most of them submarine (Baker, 2004). The Tonga-Kermadec Trench and Arc extend for almost 2500 km from New Zealand to Samoa. The Tonga-Kermadec subduction zone, where most of the larger earthquakes occur, consists of two major segments. 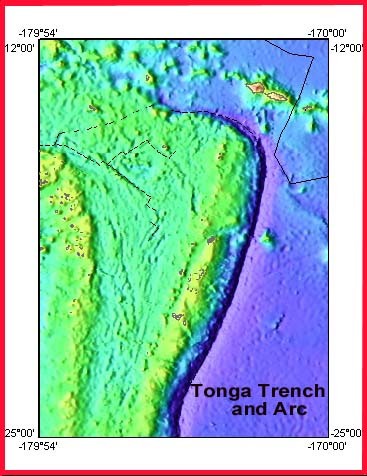 The Tonga segment is the northernmost half based of the presence of the Louisville Aseismic Ridge, located on the subducting Pacific plate, and the Kermadec segment in the southern half. The intraoceanic convergence tectonics along the Tonga Trench and the adjacent forearc between 14 S and 27 S Latitude are somewhat complicated and vary from North to South. The Pacific plate subducts westward beneath the northeast corner of the Australian plate at about 15 cm per year - which is quite high. Also the submarine morphology of the Tonga Trench indicates changes from normal convergence in the north to oblique convergence in the south. Anomalies are greater around 26 South Latitude which marks the boundary of the Tonga and Kermadec forearcs. Furthermore, along the entire length of the Trench axis, there are numerous transform faults at right angles which indicate that earthquakes in the region may be limited in rupture length. What is also significant in this region is the high number of deeper earthquakes, along a rather steep subduction boundary. The chart below illustrates the tectonic complexity of the Tonga segment of the great Trench and the lateral heterogeneity of structural features. The subduction has created very deep bathymetry along the trench and an extensively deformed volcanic arc. The earthquake of May 3, 2006 resulted from what appears to be outer rise intraplate compressional failure at a deeper focal depth - which also illustrates why only a small tsunami was generated. The June 22, 1977 Earthquake: This was the largest earthquake to strike the Tonga region in recent times. It occurred at 12h 08m 33.7s, 22 June, 1977 (UTC), or 00h 08m, 23 June 1977, local date and time. Its surface wave magnitude Ms was 7.2 (International Seismological Centre (ISC)). Its epicenter was 22.91°S , 175.74°W, approximately 190 kms to the southwest of the islands of Tongatapu and Eua (Kruger-Knuepfer et al., 1986). Its focal depth was 69 km. The earthquake was felt strongly in all the southern islands as well as in Ha'apai and Vava'u in the north. Modified Mercalli scale of intensities of shaking ranged from VII and VIII on Eua to V1 and VII on the Island of Tongatapu to less than V on the northern island groups of Ha'apai and Vava'u (Campbell et at, 1977). The earthquake caused extensive damage to houses, churches and public utilities and other structures. There was considerable damage to the Vuna Wharf in Nuku'alofa. (The Tonga Chronicle published pictures of damage to the wharf and various buildings). There is no report that a tsunami was generated. The March 9, 1994 Earthquake: A very deep focus earthquake occurred on March 9, 1994. This earthquake's moment magnitude Mw was 7.6 and its depth was 564 km - too deep to generate any small tsunami. What was remarkable about this earthquake was a series of at least 50 strong but very deep aftershocks (Wiens and McGuire, 2000), The distribution of these aftershocks were to the NNE of the main event which indicated that this must have been the orientation of the rupture's propagation. Most of the aftershocks had the same type of focal mechanisms as the main event, which indicated that their compressional axes were dipping to the west, in conformance with the general background pattern of shallow earthquakes in the region. Only a small tsunami was generated by the earthquake of May 3, 2006. Ocean buoys recorded a tsunami with total amplitude of 60 cm (less than 2 feet). Also, tide gauges in the region measured only small oscillations. The tide gauge in Pago Pago recorded a minor tsunami with 0.15m amplitude and 24-minute period. The gauge at Niue Island recorded a wave of 0.21 m in amplitude and a period of 10 minutes. With the advent of new technology and recent surveys with swath bathymetry and seismic tomography there is better understanding of the plate boundary processes of the Southwest Pacific region that can help explain why the earthquake of May 3, 2006 did not generate a larger tsunami. Also, review of the historical earthquakes in the region indicates that no significant tsunamis were generated in the past. 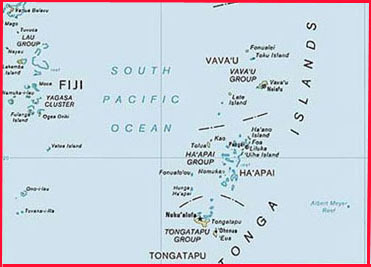 For example, the Tonga earthquake of June 26, 1917 was the largest ever in the area. Even though it had an Ms magnitude of 8.4, it did not generate a significant tsunami. Similarly the magnitude 7.2 earthquake of June 23, 1977 had an intermediate focal depth and did not generate a tsunami. Finally the March 9, 1994 earthquake had a moment magnitude Mw of 7.6 but it was very deep and outside the seismic slab. The main reason that the earthquake of May 3, 2006 did not generate a significant tsunami was the greater focal depth of 55 km. Tsunamis along subduction zones are primarily generated by shallow earthquakes in the outer rise, where the crustal failure results fom tension caused by the downward bending of the oceanic plate into the trench. Major or great shallow focus earthquakes along subduction zones usually generate larger tsunamis. Intermediate depth earthquakes may generate smaller tsunamis. Deep earthquakes do not generate tsunamis at all. The structure of the interacting tectonic plates in the Tonga-Kermadec region is somewhat different than those in other subduction zones. The angles of subduction are greater and thus most earthquakes have deeper focal mechanisms. The diagrams shown here illustrate the horizontal and vertical distribution of earthquake epicenters on the surface and hypocenters along a crossection that was taken on the Tonga segment of the trench by a recent study. 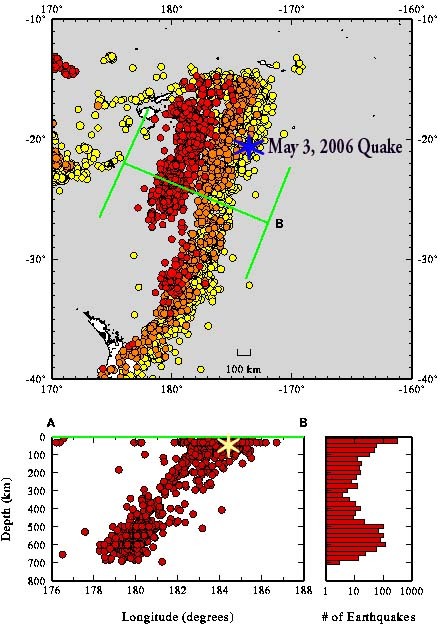 The crosection is somewhat south of the May 3, 2006 event, but the diagrams show the high incidence of deeper focus earthquakes in the region and the steepness of the downward bending Pacific oceanic plate beneath the Australian plate. The epicenter and hypocenter of the May 3, 2006 have been plotted on these diagrams. As previously stated, the May 2006 earthquake's epicenter was at 20.130°S, 174.164°W and its focal depth was 55 km. The hypocenter of the May 2006 has been transposed and plotted on this crossectional diagram further south, simply to illustrate the depth of this latest event in relation to other past events. Additionally, extenive fracturing along the Tonga Trench, form natural asperities that may constrain an earthquake's rupture length. Shorter ruptures and greater focal depths limit the likelihood that tsunamis generated in this region will have a Pacific-wide impact. In spite of the obliquity of the southern portion of the Tonga Trench and Forearc, a large magnitude earthquake could rupture two or more segments and produce a larger tsunami - although very infrequently. Most of the earthquakes occur at greater focal depths and - as already stated - none of the historical earthquakes are known to have generated a significant tsunami. A more complete assessment of the tsunamigenic potential of this region will be provided in a future report. On the basis of the earthquake data and established procedures and thresholds, the Pacific Tsunami Warning Center in Honolulu, Hawaii issued a regional tsunami warning for the immediate region that extended to the islands of Tonga, Niue, American Samoa, Samoa, Fiji, and Wallis-Futuna and New Zealand. A tsunami advisory was issued for Hawaii. The tsunami warning was issued, within 16 minutes after the earthquake and it was cancelled 2 hours later when ocean buoys recorded a tsunami of less than 60 centimeters (2 feet). Tonga did not receive the tsunami warning because of a local power failure. Baker, Edward T., 2004 Exploring for Hydrothermal Systems Along a Submarine Volcanic Arc. NOAA Vents Program. Web report. Schellart, W. P., Lister, G. S. & Jessell, M. W. 2002. Analogue modelling of asymmetrical back-arc extension. Schellart, W. P. and Passchier, C. 2002. Analogue modelling of large-scale tectonic processes. Journal of the Virtual Explorer, 7, 25-42. Wright D. J., Bloomer S H., MacLeod C. J., Taylor B., and A. M. Goodliffe, 2000. 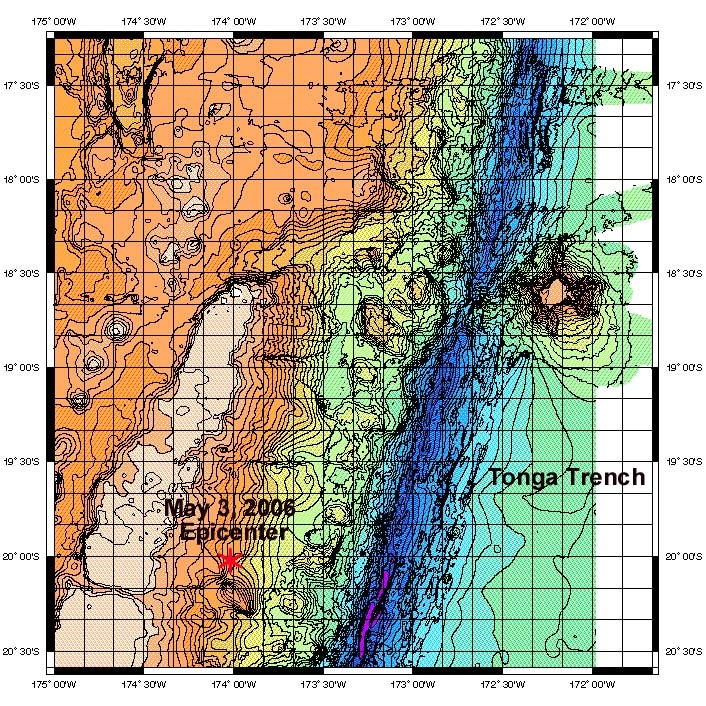 Bathymetry of the Tonga Trench and Forearc: A Map Series. Marine Geophysical Researches, 21(5): 489-512, 2000.